After crossing the high Andes we will arrive to the eastern slope that faces the Amazon jungle. Before getting into it, we will be in a cloud forest that shows an impressive landscape taken from a “fairy tale". 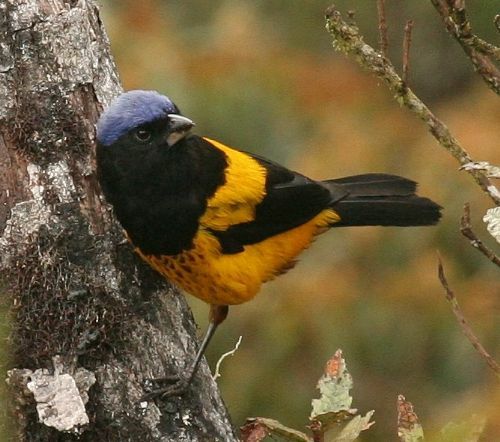 Here lives a great variety of colorful endemic birds specialized to this habitat. The first trip starts in Huanuco, when the famous Carpish tunnel (50 km. from Huanuco) is crossed, we will find a totally different landscape at the end of this path. Following the "Paty Trail” we find out strategic viewpoints that will let us take amazing bird pictures. 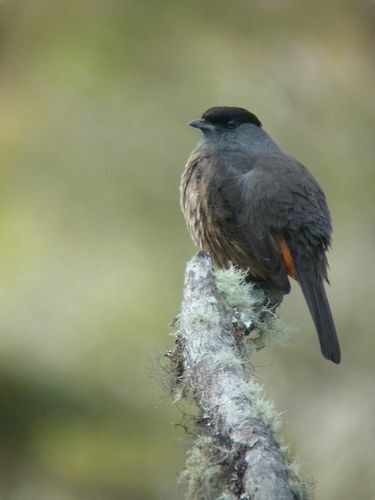 The second place is the forest of Unchog on the heights of Huanuco, following the path that goes down we will see a forest where the light changes according to the clouds elevation, it is a perfect site to find uncommon and rare species, it is a natural habitat of six endemic species, including the rare Brownish Nephelornis oneilli., The spectacular Golden-backed Mountain-Tanager etc. An archaeological remain is also located in one of the high mountains, from where we can see the immense jungle around us, if we have enough time we will be able to go into it. Climate .- Huanuco has an average temperature of 24 ° C, called by friends and visitors as the "City of the best climate in the world" or "City of Eternal Spring." In winter, July and August (21 ° C during the day and 17 ° C at night) and in the spring months of November and December (30 ° C in the day). In the highlands of Huanuco, near Unchog, the temperature drops sharply at night to -5 ° C.
Includes : The installation of camp and equipment transfers. Segundo día de visita a Carpish. En la tarde nos dirigimos a las alturas de Huanuco (3,652 m) cerca al bosque de Unchog (instalamos campamento en una zona cercana al bosque). Iniciamos un primera visita o caminata al bosque descendiendo por un camino y podremos observar y fotografiar al Coppery Metaltail, Grass-green Tanager, Golden-backed Mountain-Tanager, Yellow scarfed Tanager, Pardusco, Band-tailed Fruiteater, Bay-vented Cotinga etc. Retorno al campamento.